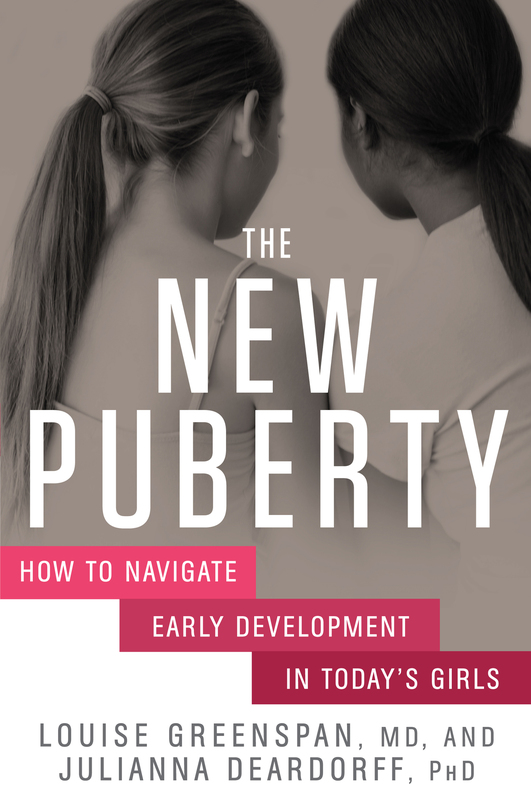 Title The new puberty : how to navigate early development in today's girls / Louise Greenspan, MD, and Julianna Deardorff, PhD. Summary "The coming-of-age experience has changed dramatically, with girls maturing sooner than ever. But what happens when a girl has the body of a 13-year-old and the brain of an 8-year-old? Contrary to popular wisdom, early puberty is not merely a reflection of physical changes--it's deeply psychological, too, with effects that can put a girl at higher risk for behavioral problems and long-term health challenges, such as obesity, depression, eating disorders, and even cancer. [This book] is a ... guide for millions of parents--as well as teachers, coaches, pediatricians, and family members--by two notable experts in the field"-- Provided by publisher. Contents Introduction: Welcome to the new puberty : is she entering puberty early? -- Pt. 1: The causes of early puberty. Move over, Judy Blume : how we define puberty today ; Going on 17 : the potential repercussions of early puberty ; Nature versus nurture : an in-depth look at puberty prompters -- Pt. 2: Strategies to help growing girls thrive. Is treatment necessary? : how to know when to medically intervene ; How to manage environmental risks : practicing the precautionary principle ; Lifestyle matters : establishing healthy habits ; "What is she thinking?" : inside the brain of a developing girl ; Don't have "the talk," start the conversation : building emotional closeness. Bibliography Includes bibliographical references (pages 231-238) and index. Teenage girls -- Health and hygiene. Added Author Deardorff, Julianna, author.